Termite Treatment – What’s involved & where to next ! Please DO NOT DISTURB the termites where possible. 1. 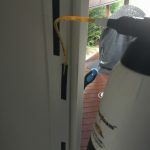 A visual Termite Inspection must be completed to all surrounding areas including the structure prior to any termite treatments carried out in Brisbane, because without an inspection you really have limited knowledge of what’s happening around the home as termites are normally hidden well inside the walls. 2. Termite Treatment, Once termites have been located, they must be treated with minimum disturbance as possible. The termites must come in direct contact with the termiticide to achieve a successful termite treatment. The termite treatment using a registered Termiticide is an important part of a termite management program that is essential which must always be completed by a qualified and experienced termite management technician. 3. Once the termites have been treated the areas are to be closed up ie Taped or covered to allow minimum disturbance to the working termites. 4. Patience, Waiting at least 3 -4 weeks is required to give the termites time to travel back and forth from the site to the nest to help in the process of eliminating the colony (Termite nest). Taking your time at this stage is critical in ensuring a successful eradication of the colony. 5. Re inspection of the areas treated. A further invasive inspection is now required and assistance from a qualified builder is always considered an essential part of the invasive inspection. All areas treated should be opened to allow a visual inspection of all damaged areas. Why ? – 1. To check for live active termites, if found further treatments are required. 2. To determine structural damage 3. To find termite entry points. 6. Once the property has been checked and assessed by a qualified and licensed builder and the live active termites are no longer visible, then a Termite Barrier can be applied or an Interception & Baiting System.